Nexter, a KNDS group company, leading European terrestrial defence company, is present at Indodefence 2018 from the 7th to the 11th of November 2018, in Jakarta, on one of Asia's most important defence and security exposition. Nexter, which provides 100% of French land forces combat systems, is one of the world main artillery producer. The Group intends to capitalize on a perfect and hundred year old control of the weapon/ammunition couple. Supplier of the Indonesian army in CAESAR® artillery systems, Nexter unveils in Jakarta its large solutions and equipment range; from artillery to ammunition, all the way up to AFVs and robotics, naval weapon systems, decision aid and simulation tools. On a very demanding market in which Nexter has already proven itself, the artillery offer is presented by a 105LG1 cannon with functional digitalization, an Indonesian Forces CAESAR® 6x6 and a FINDART® fire control system. Nexter's offering also include formation and training simulators for the firing crew, both physical (CAESAR® Crew Training System) and digital (tutorials, 3D simulators...). Nexter also shows its expertise in the Armoured Fighting Vehicles field. The Armoured Fighting Vehicle (VBCI) can be fitted with turrets of different caliber: from the lighter (12.7mm) to the heavier for these types of vehicle (105mm) but the 40mm cased telescoped ammunition. Thus the VBCI combines a remarkable tactical mobility, a heavy carrying capacity, a high protection and an exceptional firepower, adapted to most land threats. Nexter Group is also system integrator in the land UAV domain and its expertise encompasses mini-robots from the NERVA® range to tactical polyvalent robots of the OPTIO® range. The NERVA® LG is showcased on the stand. It is capable of hosting a large range of payload while remaining highly mobile. So it is particularly adapted to recon missions, NRBC detection or explosive devices neutralization in extreme environments. Nexter is also present in the naval domain with a model of its NARWHAL®20A. Already equipping the French Marine Nationale and numerous other navies in the world, this weapon system has become a reference. Thanks to the 20M621 cannon, the NARWHAL® is particularly adapted to surveillance and maritime police missions. It can also fulfill very short range self defence missions against drones and light vessels. To complete Nexter's stand, ammunition will be showcased. In that respect, visitors will be able to find a range of calibers, from 20mm to 105 ERG, destined for tank and naval weaponry. SP’s ShowNews was introduced to co-op with the aspirations of our global clients. 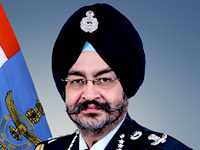 Aimed to give the latest and instantaneous reporting during the leading shows in Asia such as Aero India that caters to military and civil aerospace sectors, Defexpo that specifically caters to army and navy sectors (both organised by Indian Ministry of Defence) and India Aviation that caters to civil aviation sector (organized by Ministry of Civil Aviation). 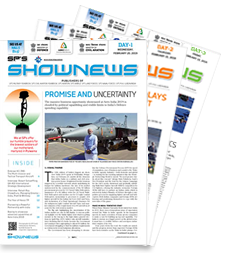 SP’s ShowNews is being regarded as one of the best show dailies in the world.